New book, some shelf wear to cover. 418 pages, 40 photos. 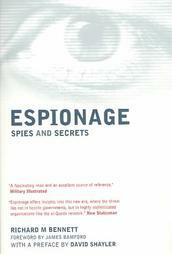 This book contains over 500 entries covering every aspect of modern-day intelligence gathering and counter-terrorism, details of individual spies, politicians, and diplomats. With profiles of the key historical events and scandals from the history of spying, this book is the ultimate guide for anyone with an interest in this subject.